If you are new to the game of web design, and you want to make your own website but you lack coding knowledge, it is important that you choose a content management system (CMS) that is easy to use, while at the same time rich with features that can help you create high quality content. This is exactly why WordPress is such a good choice. Starting as a blogging platform in 2003, it has grown into the best and the most versatile CMS out there, with about 27% of popular websites today using it. Here are some of the reasons why you should be using it as well. One of the greatest reasons why WordPress is so versatile is the huge variety of plugins that its community offers. The plugin directory on WordPress.org contains more than 30,000 free plugins which you can download and install directly from the admin panel. These plugins improve WP’s functionality and help you out immensely with technical tasks. The options are many, with plugins that increase your security, caching plugins, various social and eCommerce plugins, plugins that help you improve your design, etc. While plugins add new features, the great variety of WordPress themes can change your entire website, adding aesthetic options to set up colors, layouts and menus, while at the same time giving you new features that are grouped together to meet specific demands of a certain business sector. If you don’t have a big budget, there is a great number of WordPress themes that are free, the same as a lot of plugins are. However, if you’re looking for the best, you should invest in a premium theme, which offers superior options and comes in the form of a packaged folder that you can upload directly to your WP website. The fact that WordPress is open source means that it’s free for you to download, install and use any way you like, as well as that it’s a community software. It is maintained by a great community of enthusiasts, of whom a majority are WP consultants, constantly working on it in order to improve it. The WordPress community is made out of hundreds of developers that come from all over the world. By using WordPress as your CMS, you become a part of this great community, and you can get support from other members, as well as make your own contribution once you become more experienced. Being such a popular CMS, one would expect that it’s quite vulnerable to hackers. However, WordPress is very serious about its security. There is a big security team behind it which is constantly working on making it safer to use. While it is common sense to practice certain measures like avoiding theme or plugin downloads from untrusted sites, WordPress constantly provides updates for its software in order to prevent hacker attacks. It comes with an automatic update feature, so you don’t have to worry about this yourself. Another important aspect of WordPress is that it’s very friendly with search engines. Some of the best WordPress developers from Sydney will tell you that when searching for a good CMS, having SEO in mind is essential. WordPress is written in standard compliance high quality code, and its semantic markup makes your website appealing to Google. Search engines like WordPress because its architecture is quite logical and its design is very responsive. Thanks to its clean and simple code, Google’s spiders have no problem when they crawl your pages. You can easily assign meta tags to your pages in order to make SEO more accurate. Every website designer knows how using multimedia, such as videos, images and audio files, can improve your visitors’ user experience. WordPress makes it very easy to implement multimedia files into your posts and pages. Besides, it does more than make it easy for you to upload multimedia files – it makes it possible for you to edit them, using the Media Library Screen. Here you can edit, view and delete the files that you have previously updated. Compared to its peers, Joomla and Drupal, WordPress is the simplest and the most easy to use CMS out there. You can build websites with it without having extensive coding knowledge or using complex programs. It is very easy to change the content, layout and functionality of your site. The WP dashboard is very user friendly, and requires little time to master. The internet contains a huge number of articles that are written in order to help out beginners with building their website on WordPress. 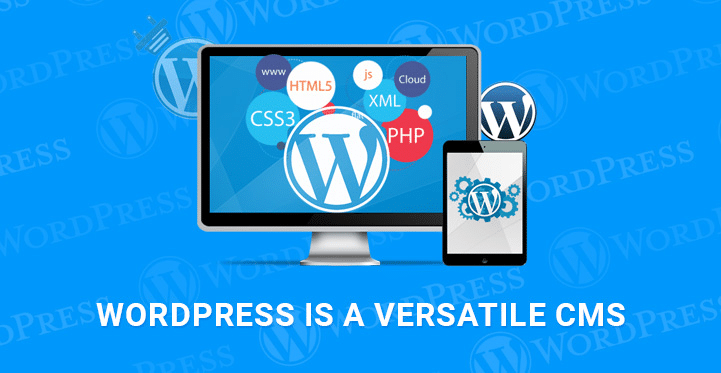 WordPress is used by people all over the world, which means that it has plugins that handle translation into different languages and makes it available for everyone to use. It’s constantly growing and it’s not going anywhere any time soon. As an easy to use and a versatile CMS with an amazing variety of features, it is the best choice for your new website. Steven Clarke is a digital marketing specialist/web entrepreneur. In his spare time, he likes to write about his ideas and share them with the world. Steven is a regular contributor to several websites.